Do you know, my original title for this was "The Early Bird Gets the PR". I hastily changed it before posting because it was the most cynical title of I'd ever read, of anything, ever. But, it has undeniably happened. We have another earliest bird that has once again knocked Archaeopteryx off of its perch. Here it is; it's called Aurornis xui, and here is Jon Tennant covering it for Discover. Archaeopteryx has now been knocked off its perch so many times now that it has a broken beak, walks with a heavy limp, and is hurting so much that it is wondering to itself why it keeps bothering to climb back up to its perch every time. So, maybe we should ask ourselves that very question: why does Archaeopteryx keeps getting moved around the tree of life every time we find a new bird specimen? The first thing to realise is that the group of organisms that archaeopteryx belongs to, namely the dinosaur-like-birds (or bird-like-dinosaurs) has been revolutionised over that past couple of years by the sudden explosion of fossils from China. We now have a veritable flock (or herd) of these early birds that all need to be placed on the tree of life. So, it's understandable that we would get some fossils here and there that sit in interesting places in the tree of life. The other point to raise here is that this process is a routine part of palaeontology. In fact, this shifting round of evolutionary trees is occurring all the time with all parts of the tree of life. We hear about Archaeopteryx because it occupies a special place, not just in the tree of life itself, but in history. Arhchaeopteryx was the right fossil at the right time that neatly plugged the gap between birds and dinosaurs that had hitherto been vacant. Nobody cared when, in my field of invertebrate palaeontology, the Xenocarids suddenly became the closest cousins to the insects (gratifyingly except for Carl Zimmer). The fact that birds are in fact dinosaurs is one of the most remarkable discoveries of last hundred and fifty years, and so it's not surprising that the general public would care about the position of the one iconic fossil that cemented the hypothesis. Here, however, we come to the most important point. Every new fossil early bird, be it very birdy or very dinosaury, is likely to cause the whole tree to be transformed. Surprised? Many people may be under the impression that each time we find a new bird fossil, we examine it and see how dinosaury it is, and if it is more dinosaury than Archaeopteryx, we simply slot it in below Archaeopteryx. Yet, this is just not how we make trees in palaeontology. If we have some new fossils that can't easily be placed into another group, we make a new tree from scratch that is likely to have very different relationships between the organisms within it. Let me explain. We work out the relationships between organisms in a tree, both fossil and modern, using a system known as cladistics. At it's heart is Ockham's razor, namely that the most simple solution is likely to be correct. So, two organisms that look similar to one another are more closely related to one another, and so a diagram of similarity in form is also a tree of evolution. (Please note that I am simplifying heavily here, and don't be alarmed at the many, many question marks; there's a very sophisticated methodology that also informs how our character states are decided, so it relies on as few assumptions about the evolution of characters as possible). We then use an analytical program to work out the relationships. To show you what I mean, I've made up a little dataset for this post and ran it through a phylogenetic analysis program. I've made up 10 fictitious character matrices for 10 fictitious birds; you can see these characters on the right in the image below. When we run the program, we find that bird B and C are the most derived birds. Birds A, I and J sit at the most ancestral end of the tree. The way that the program works is using a principle of parsimony, i.e. the tree with the fewest transformations is the correct one. For example, if we look at vertebrates, it's more parsimonious that backbones are ancestral to all vertebrates, rather than each group evolving a backbone independently. Now, let's throw a spanner in the works and introduce a new bird, bird K. The new character set is below, alongside the tree. First look at the character matrix. Note that it is quite similar to bird J, differing at just one character. Now look at the tree, and compare it to the previous tree. Notice something funny? You should have noticed that the tree has been transformed. Remember that this has happened by the addition of one new fossil that differs only slightly from the other fossils. In particular, look at bird H. In the original tree, bird H was more derived than bird F, however, after the addition of bird K, bird H is now more ancestral than bird F. So, what we have here is the changing in position of our organism after the addition of another organism that is only distantly related to our organism. The truly remarkable thing to realize here is that just one character can tip the scales. In a very real sense, finding that the toe bone is inverted can turn the tree on its head, and alter the way we see the evolution of a group that happened over million years. And, there you have it. The reason why we keep hearing news about archaeopteryx moving around has a lot to do with the fact that, as soon as we add a new fossil, the whole tree is transformed, not just the twiglet of the tree that archaeopteryx sits on. Finding a fossil that lies close to archaeopteryx is more likely to move archaeopteryx, but it needn't be close to shift archaeopteryx. 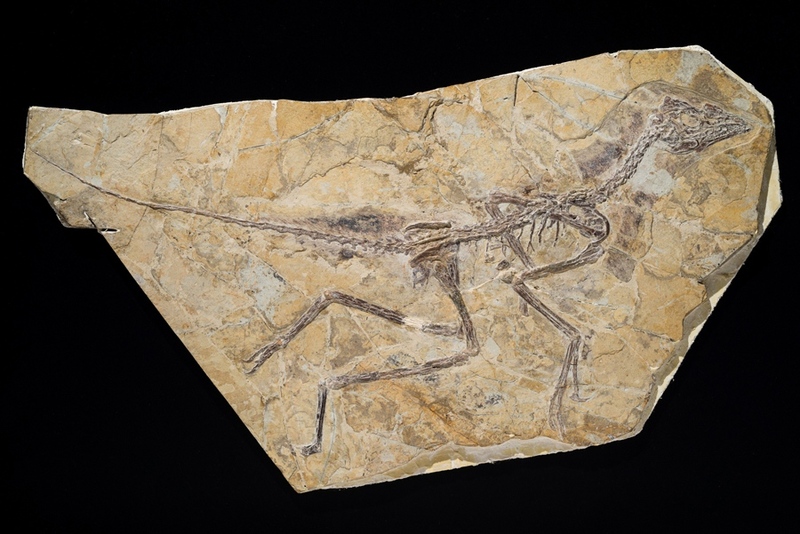 In the case of the most recent paper, it was a clear cut case of finding a new fossil that simply had a greater amount of ancestral character states than archaeopteryx. They scored their new fossils based on a tree analysis that was already in the literature. The time before that archaeopteryx was moved, it was moved on the the team using a different algorithm to produce their tree; here, it's an open-shut case of simply finding some very ancestral looking birds to plug into a tree. All in all, it is becoming increasingly clear that archaeopteryx belongs to a group of animals that are on the edge of where we choose to define a bird. I want to end by saying that we don't just do these analyses for good book keeping. Yes, a corollary of doing this work is so that we can name specimens effectively. But, more fundamentally, we do these trees so that we can fundamentally understand the evolution of a group. In other words, we can use this to find out which characters were close to the base of a group. Was flight fundamental to the evolution of the birds? Or was it the ability to perch? Or was it feathers? We have a real chance of answering these questions using phylogenetic analysis like I've described above. I should take this moment to apologise to readers that asked me to talk about this the last time round it happened. I got there eventually! Also, I should also mention that the area that the fossil came from is absolutely fossil hoaxers, so it might be wise to hold your breath until someone does some EDX on the fossil. In fact, Luis Chiappe, fossil bird guru, says that the fossil looks too good to be true.